For the New Years I wanted my nails to be fun and festive! 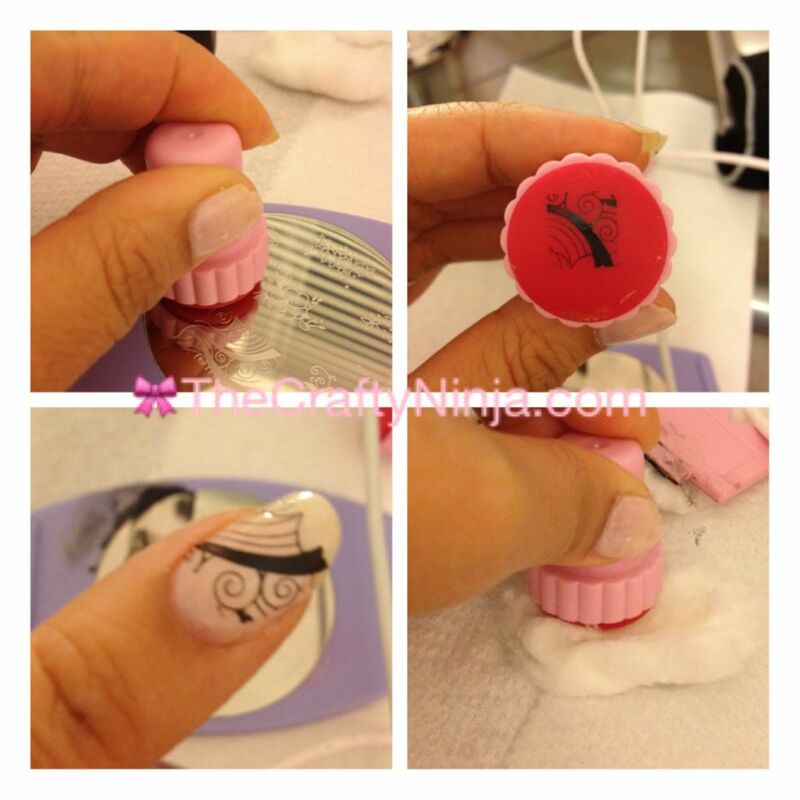 Here is my detailed step by step instructions on how to use Konad Stamping Nail Art Kit with pictures. The Image Plate I will be using is m51 and a Konad Special Nail Polish in Black. Make sure to set up before you start with: a paper towel to protect your workspace, cotton balls soaked in nail polish remover, image plate, stamper tool, and scraper tool. (I used my image plate holder from my Salon Express kit: http://thecraftyninja.com/salon-express/) I first protect my nails with a clear base coat. You can use any nail polish color of your choice, which I used Rimmel French Lingerie. Make sure your nail polish is dry before you start or it will smudge. Step 1: Brush the Konad nail polish in Black only on the image you want. Use the scrapper tool to scrape off the polish, I clean my scrapper tool off with one of the cotton balls soaked in nail polish remover. Step 2: Next I take the stamper tool and press down firmly on the image to pick it up. I stamp it on my finger using a rolling technique. (I added exactly how to roll on the last image) Then clean off any polish off the stamper tool on another cotton ball soaked in nail polish remover. Step 3: Here is my rolling technique: Start from one end of your nail and roll the image to the other side slowly and pressing firmly. Repeat the each step for all your nails! Practice makes perfect, keep playing around until you get the desired look. Happy stamping!